Steven Erikson is a genius. His Malazan Books of the Fallen are the only books I’ve read that rival–possibly exceed–Tolkein for the sheer weight of imagined history. But Erikson eschews Tolkein’s formality. His characters live and fight and die in the muck and dirt. Generals and soldiers, gods and monsters, ancient races and undead warriors, they all tread the same dusty roads as the rest of us. They feel like real people in a way the Riders of Rohan and the defenders of Gondor, for all their glory, never do. I care about these characters, and I’m excited when a favorite turns up–or is even just mentioned in passing–in one of the novels. And yet for all that they are military fantasy and dwell on the fate of armies and empires, a streak of incredible compassion runs through Erikson’s work. He’s written some about it here, and I freely admit that Reaper’s Gale is one of the few books in the last ten years to make me tear up. So I’ve wanted to check out Ian Esselmont’s Malazan books for a while. He and Erikson created the world and many of the characters together, and Erikson’s success provided a springboard for Esselmont to sell his own novels. Having read all of Erikson’s books, I wondered if Esselmont’s would scratch that itch for more. Night of Knives came close. The novel tells of a pivotal event that closely precedes the start of Erikson’s books. It takes place in the course of a single night and focuses largely on two new, minor characters–a young thief named Kiska, desperate to get out of a town she sees as a dead-end backwater, and a veteran soldier named Temper, semi-retired but unable to let go of old loyalties. Both find themselves caught in a conjunction of powers far beyond their understanding, but both play a key role in the events that follow. Readers familiar with the Malazan mythos will know how the night ends, but not how we get there and who pays what price in the conflict. Esselmont isn’t the storyteller Erikson is. The prose drags at time. The characters are interesting, but not quite as engaging as Erikson’s. But it’s his first novel. And looking back with honesty, Erikson’s first novel–Gardens of the Moon–has some pretty clunky bits. He honed his craft pretty heavily between that and Deadhouse Gates and continued to grow as a writer throughout all ten Malazan books. Esselmont has an advantage, though. Where Erikson was introducing readers to the world, Esselmont gets to leverage the weight and gravitas that Erikson has built up around their shared characters. Names like Kellanvad, Dancer, Surly and Tayschrenn still resonate, and when these iconic characters appear and interact with the new characters, the frisson of recognition and wonder is right there. 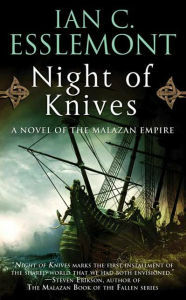 In the end Night of Knives comes close enough that I plan to pick up the second book and give him another shot.